Vistas del Perú souvenir deck, made in USA and imported by Edw. E. Muecke, Lima, Peru, c.1920s. Black & white oval photographs on each card present a range of views of Peru, with captions in English and Spanish, including views of the Port of Callao, local Indian people, Franciscan monks, manufacture of ponchos, Peruvian railway lines in the Andes, views of the city of Lima, the Andes mountains, etc. The cards have gold edges and come in a slip case. 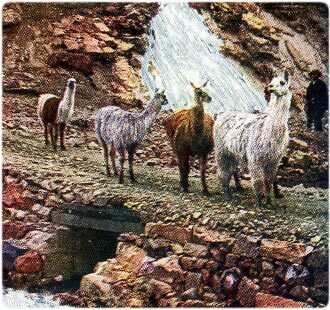 The reverse features a colour photo of Llamas inside a red & white border. 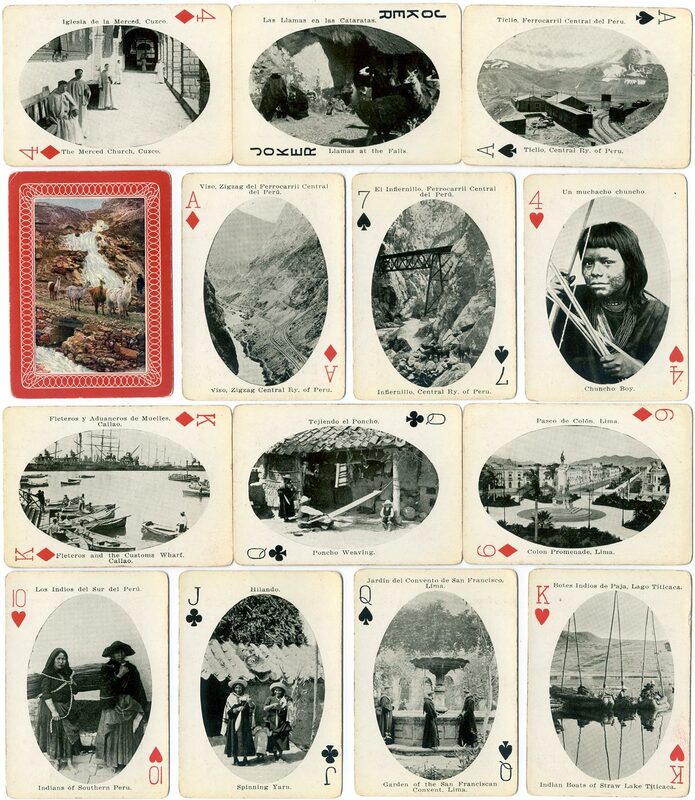 Above: Vistas del Perú souvenir deck, made in USA and imported by Edw. E. Muecke, Lima, Peru, c.1920s. 52 cards + joker in slip box. See also: Recuerdo del Centenario - Vistas de Lima Souvenir of Peru playing cards made by Standard Playing Card Co., Chicago, c.1910.